Samantha Elliot's father ran her life - even after his own death. A strange provision in his will demands that Samantha move to New York City and investigate the mysterious disappearance of her grandmother. Shy, divorced, and naive to city life, Samantha arrives in New York and meets Michael Taggert, the handsome landlord of the apartment her father has already chosen for her. What she doesn't know is that her father also chose Michael to be her secret guardian. Soon sparks fly, but Samantha's tragic past keeps her distant. But as her family's history begins to unravel, so does Samantha's cold exterior, and despite her determination not to, she cannot help falling in love. 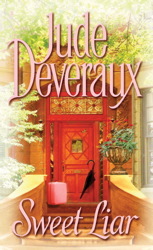 Once again, Jude Deveraux delivers a marvelous combination of romance and mystery, power and passion - which makes Sweet Liar a very special audio experience.